I hope this blog will help other women realize that they don’t have to be something they are not. You are just fine the way you are. We all have our flaws, but we have a lot to offer too, and if others don’t see it, then screw them! Medium, my 10 year-old son, was recently diagnosed with type I diabetes. I hope to use this as an outlet to share my experiences with this awful disease and maybe help someone else who is on this journey too! You are a wonderful mom and I know this blog is going to help you and others share a lot of information about diabetes and just how to be a normal person in this crazy world. 🙂 Your are awesome! Don’t forget the “I hate Vegetables” part! That’s a very important part of what makes you you! You’re like the female Jay Leno. Your’e “kids” are right here! 😉 Ha, don’t worry, I already knew that. I’m a wife, a mom and my pancreas is dead. LOL. I’m type 1 diabetic, just like “Medium”. Loving your blog already! My 6 year old daughter was diagnosed around the same time as your son (Jan 23, 2012…Happy New Year, eh?). All of the posts I’ve read so far sound exactly like what I am going through, how I am thinking and I am feeling. It’s good to know we’re not alone. As another T1 Mom said to me: Welcome to the greatest club you never wanted to be a part of. Some of your posts made me laugh – thank you. I needed it this morning. Krissy, I am going to have to steal that, “the greatest club you never wanted to be a part of”. How true is that? The only silver lining to this is meeting other people like you, whom I would never have know otherwise. Glad I could help in some small way! Thanks for reading! Welcome to the DOC! 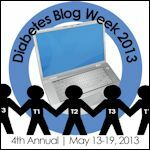 I don’t blog, just a reader of all the great d-blogs! I sent you a friend request on FB! My sweet one is my 11 year old daughter living with T1 since 8/21/08. Welcome to this journey that none of us chose. Choose to focus on the blessings and to me it’s all the great d-moms I’ve met! Beth, thanks for the welcome! Another mom said, “welcome to the greatest club you never wanted to join!” So true! But I can already tell it is going to be better now the I have found the DOC. Thanks for stopping by my blog! And I will “see” you on FB! Mmm McDonald’s Diet Coke–yes! It’s not just the wide-gauge straws. Something in the formula. I’m so glad I found your blog!